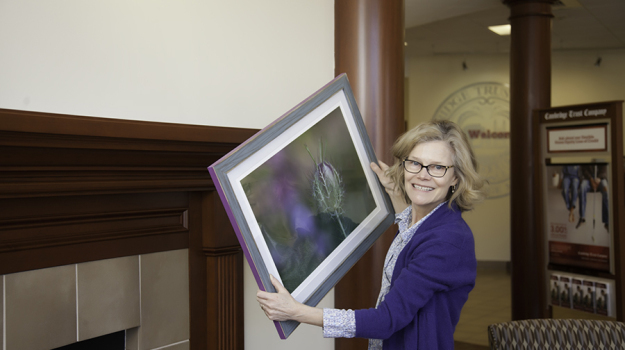 I’m thrilled to announce that today I mounted a display of six of my nature photographs. The exhibit marks the official kick-off of my spin-off. The Family Album portraits has branched out to Andrea Joliat Photography, fine art nature photographs. The display, ‘Finding Focus’ is a collection of photographs that I created while pursuing my interest in macro photography of plants. While photographing flowers in the outdoors I began feeling that a beautiful perfect flower wasn’t always what I related to. I found myself searching for something else. Sometimes my eye would catch a portion of the plant such as the curl of a tendril dangling from the stem. At times I found the shape of the flower interesting in the way it stood out from the colors and patterns of the background around it. Often I found beauty in a simple portion of a leaf or an aging and scraggly weed. I enjoyed the process of looking for small slivers of beauty. While the nature photographs make enjoyable and intimate small prints I also enjoy them as large graphic prints. 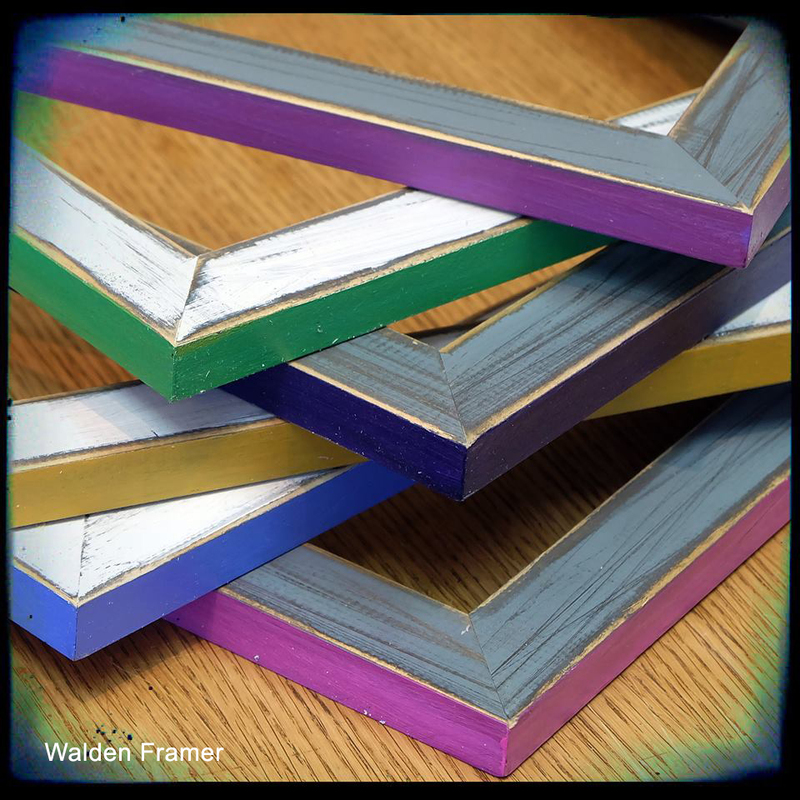 Framed in the shabby chic frames custom-designed by Walden Framer, they make colorful wall art. For all sizes I print the images on Hahnemuhle Digital Fine Art Collection paper for permanence and a rich color rendition. 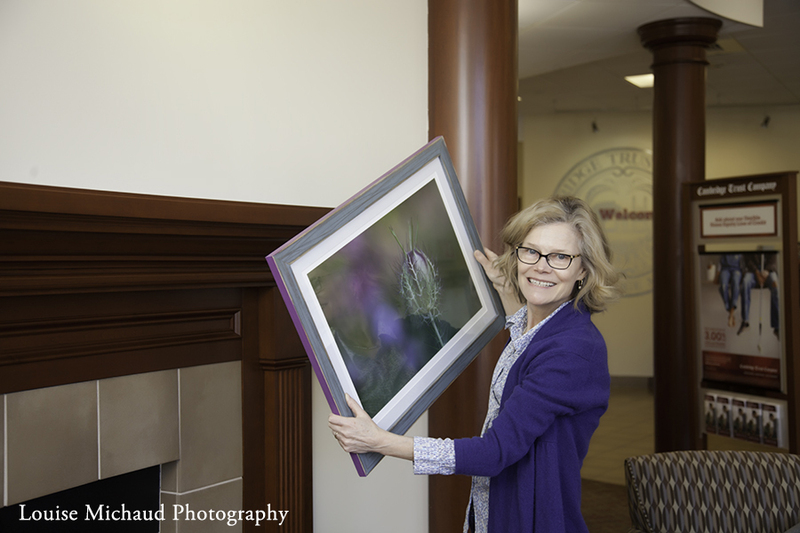 This nature photographs display was conceived at the invitation of my banker, Stacy Sheehan at Cambridge Trust Lexington. Stacy is a true supporter of local small business and an all ’round best banking representative ever. She has also developed some excellent strategies for managing our family banking; ideas we wouldn’t have come up with ourselves. She’s an amazing person and it’s no wonder that she was recently the recipient of Lions Club’s exclusive Melvin Jones award for humanitarian service. 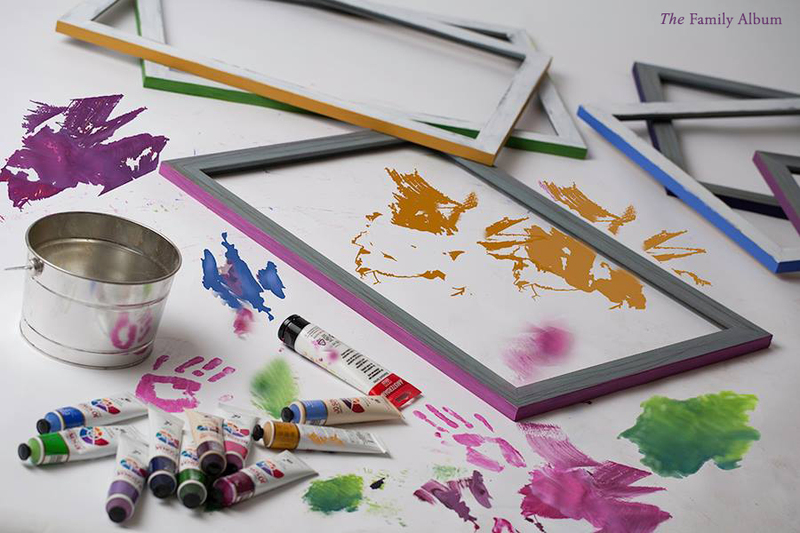 Part of– a huge part of– creating a display is the presentation. I brought my prints to Walden Framer for help from Ed Pioli. Honestly, there is no place else I would have considered going! 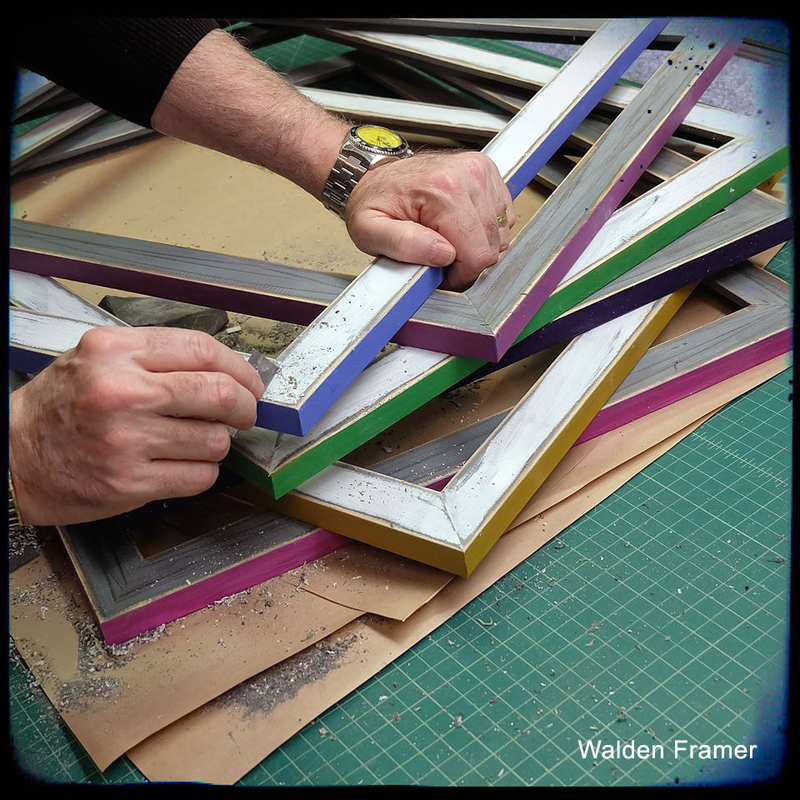 And there’s a reason for that; Ed is the most creative and talented frame artisan I know. And, he’s a collaborator. When I was considering plain white frames for the nature photographs he said “Let me think about it.” Well he did. And what he came up with were frames that perfectly enhanced the essence of the nature photographs in every way. When I say he likes to collaborate I mean that literally. 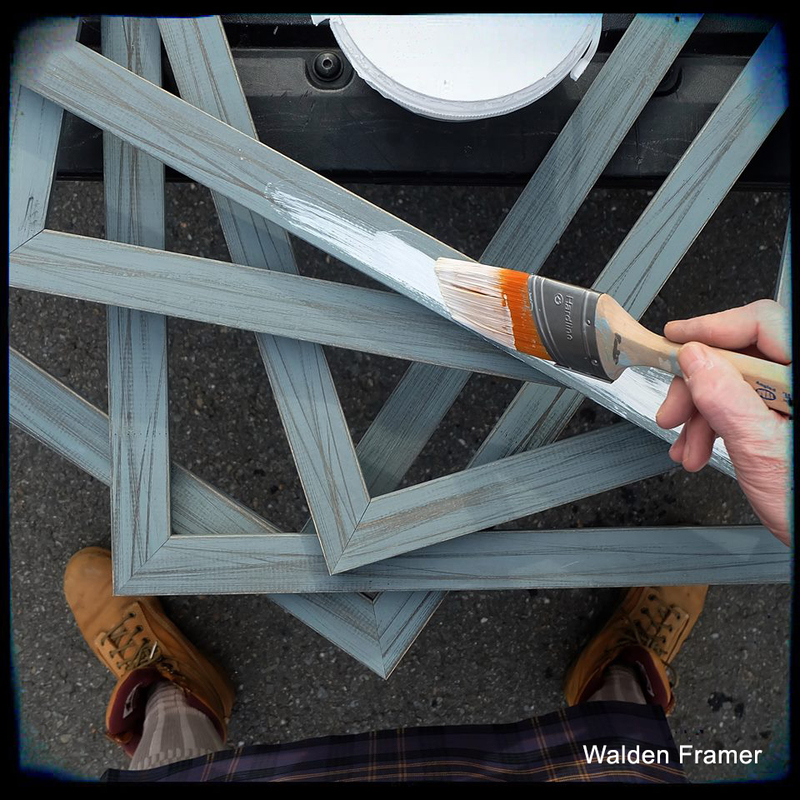 He ordered the frame moldings and paint-washed them and it was up to me to pick the frame edge colors and apply the paint. There was a lot of back and forth and I mean that literally too–from Walden Framer to my studio and back again several times. Good thing he is nearby on Mass Ave. You can see the frame evolution in the photographs below. Last but not least, I had the help of my friend and colleague Louise Michaud of Louise Michaud Photography in Salem, MA. She helped me to decide which photographs to display and how to arrange them. Louise is also a PPA Master Photographer and I can always count on her good eye to help with design decisions. She helped me to get the photographs onto the wall hooks without dropping them on the floor of Cambridge Trust and managed to get some action photographs at the same time. Thanks Louise! I owe you! 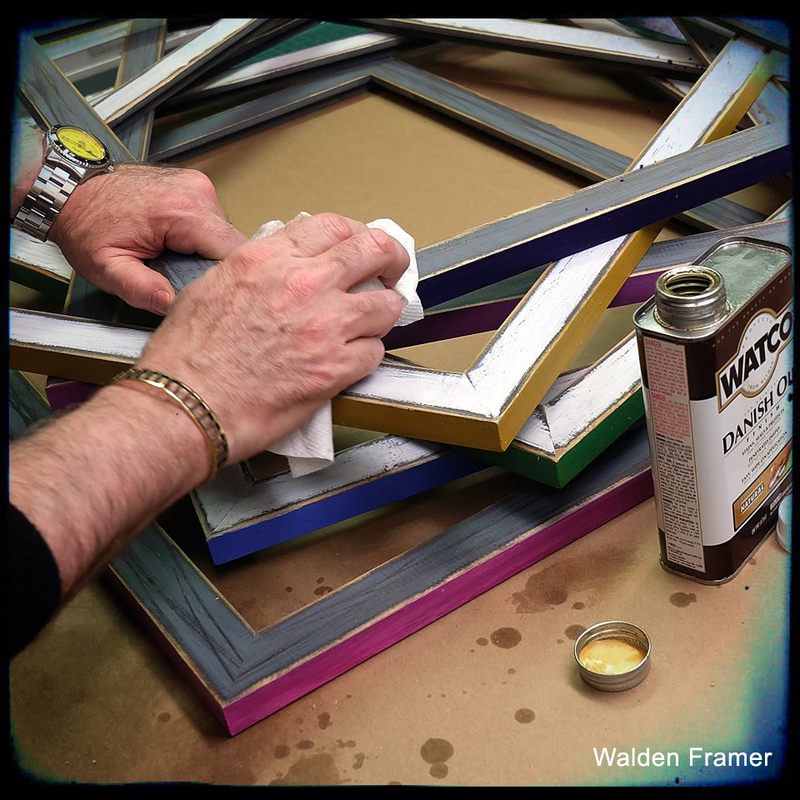 The process begins at Walden Framer, Ed keeping his kilt clean. A little edge color added at the studio. Ed applying some sort of magic elixir. Ready for matting, wiring, glass and prints!